nevard_130121_PGCH_IMG_2747, a photo by nevardmedia on Flickr. 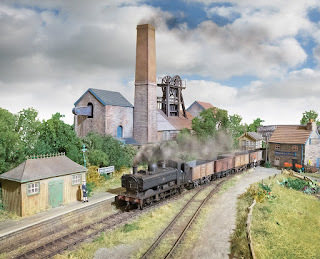 Polbrook Gurney Colliery Halt is Polbrock as serialised in Model Rail last year, but now in the process of being extended width and lengthwise to incorporate a Bristol coalfield inspired colliery from my moribund Mendip Colliery project. 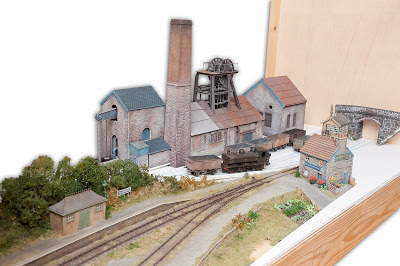 The layout here looks more complete than it really is, the photo here being the result of carefully lining up colliery buildings behind Polbrock, which earlier today was extracted from its diorama case. The sky I admit has been Photoshopped in, but is very similar to what I have planned to go behind this somewhat bigger metamorphosis of Polbrock. The new backscene will be around 18 inches high to allow photos like this without having to resort to filling in the sky to cover up the ceiling or exhibition hall with a photo-editing programme. 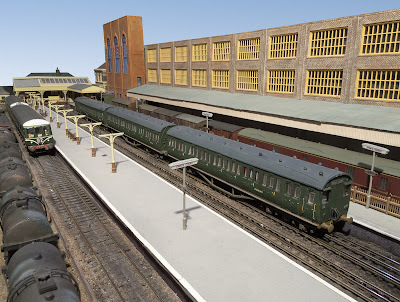 Anyway, enough rambling, I need to pull my thumb out to get it finished in time - First outing is RAILEX end of May! St Albans Model Railway Exhibition is one of the first on the new year calendar, but despite being a model train loony for more decades than I really want to mention, it's not one I've had the pleasure of visiting before so I took out a small 'payday loan' to afford the rail fare (kidding, but don't start me). This show, out of the many I have visited over the years appeared to embrace a broader spectrum of layouts than many others I've been to, with everything from 2mm finescale (2FS), 3mm to the foot, depicting Brunel's 7 foot(! ), P4, S Scale, OO, N, 0 gauge and so on, with a little HO thrown in for good measure. 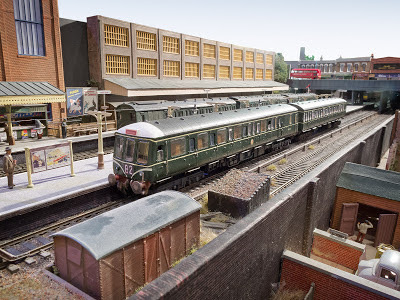 As I write this, I don't think I've ever been to a show with so much variety on the scale/gauge front ever - apart from maybe The Warley Show at the NEC. For many people, the key thing is the distance between the rails and the flange gaps is paramount, that's fine of course, as long as all else is equal with the rest of the modelling to match, but I personally look for something that congers up emotion and atmosphere. I want that special something that makes you feel like you're really there, or at least looking at an old Colour Rail slide, but in 3D and with movement. Earl's Court, illustrated here is just one of those layouts, it depicting a 'could have been' LMS/GWR joint 'overground' terminus in West London during its final years - a most unusual GWR branch line terminus! Having lived in the capital for many years, it has all those key features that shout 'West London'; the rundown cramped location, much of it still showing signs of wartime damage from 20 years prior with the yet (and never) to be replaced canopy, a mix of Western Region diesel multiple units, a little mixed WR/MR steam and some 4 rail activity, milk tanks, parcels stock and so on. Despite run down location there are is a hint of modernisation, with new fluorescent platform lamps contrasting with much wrought iron from the turn of the century, the old century that is. With a model as well observed as this, the gauge, scale, flange width or the code of rail is totally unimportant. Don't worry I'm not anti the 'correct gauge' thing, but I do think that maybe all those other less obvious things that make a layout 'real' should also be looked and maybe greater emphasis on design, composition and colour should not be forgotten. The key to that, is looking at the real world, whether it be first hand, photos in books, or the internet, then throw away the calipers and absorb the atmosphere. For me, all that was missing was the smell of disinfectant, the pong of a bad sewerage system and maybe the smell of that new Chinese restaurant that's just opened next to the coffee bar with Radio Caroline playing on that new new fangled battery powered transistor radio. nevard_130104_catcott_IMG_2487, a photo by nevardmedia on Flickr. For a short wihile in 1962 Stanier 4MT tanks were tried out on the former SDJR system. Captured through the photographer's new 200mm lens, the dark sky in the distance would suggest a thunderstorm over the Bristol Channel. Anyone with a litle knowledge of this now gone but much loved route will know that te above is a load of old balony. However various engine types were tried out over the former Somerset & Dorset Joint Railway network, with some quite oversized engines appearing during the line's final few years. In the autumn of '63 BR Standard Class 9 locos with their large (by British standards) 2-10-0 wheel configeration returned, not to haul summer Saturday expresses but the Bath to Bournemouth 3 coach stopping service. Later BR Std Class 4 tanks appeared to on the 'mainline' too as dieselisation cascaded engines to 'lesser routes'. Much of the 'Branch' (Evercreech to Highbridge and Burnham on Sea) went across the Somerset Levels following the route of the old Glastonbury Canal, and I believe much of it floated over the extensive peat bog probably using branches from the locally willow tree as a base. For this reason light weight engines were usually the norm. A railtour in the early 1960's did however bring a couple of SDJR 7f goods locos down the line and I imagine Highbridge Loco before 1930 bought severaly bigger types through too. 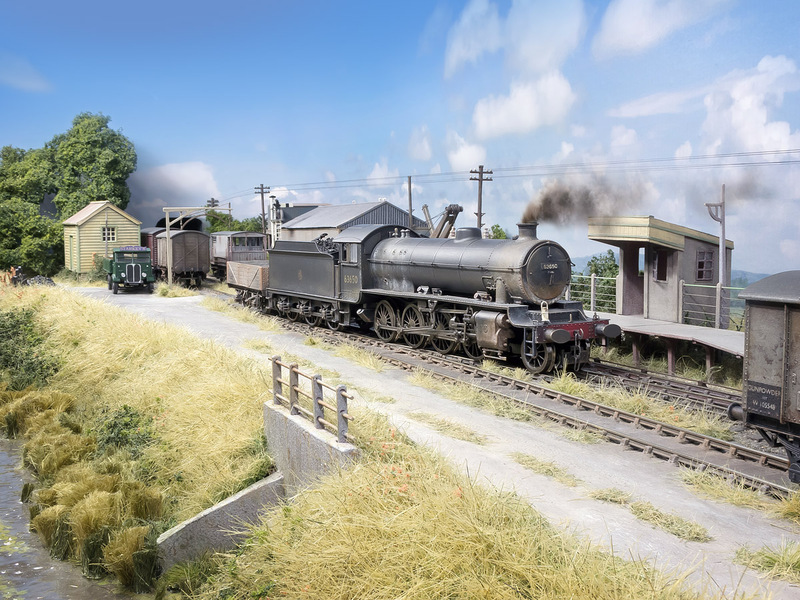 However despute the above, I do think the above large Stanier Class 4 tanks fit in quite well, so in that parallel universe of 'it's my trainset' who knows!